The dry weather through much of NSW continues, and grain prices have risen. There is little good news on the weather forecast, and the impacts on lamb supply could be significant. As such this week we’re having a look back at the impacts of a dry winter and spring on relative lamb prices, and some of the opportunities this could create. We have been hearing plenty of anecdotal evidence of increasing lamb supplies coming out of NSW, but also that lambs are struggling to put weight on due to a lack of feed. In theory slower weight gains should see increased supply of store lambs, and weaker supply of finished lambs. Restocker prices couldn’t be any more expensive relative to trade lambs than they have been in the past twelve months. 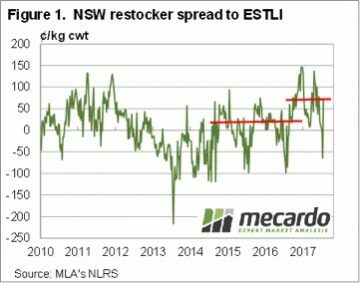 Figure 1 shows that since the start of September in 2016 restocker lambs in NSW saleyards have been prices as high as a 150¢/kg cwt premium to the Eastern States Trade Lamb Indicator (ESTLI). The average restocker premium over the past 9 months has been 62¢. The average has been higher than almost all of the peaks seen in the restocker premium since the start of 2012. A dry season will have the impact of increasing supply of light or restocker lambs, while also weakening demand, as grain and grass become more expensive. The last time restocker lamb prices spent a long time above 50¢ was during the wet years of 2011-2012. During the subsequent dry year’s restockers wound their prices back to a hefty discount as the flock was liquidated, and lambs prices were in the doldrums. It would likely take a couple of dry years in a row to see restocker lamb prices fall to a discount to the ESTLI. The more likely scenario would be restockers paying a similar premium to that seen during 2014 and 2015. Those years both had ordinary spring and summer rain, and much stronger grain prices than last season. Seasonality shows us that the restocker premium usually peaks in the spring, with 50¢ being the level of spring 2014 and 2015, which is a pretty good target for the coming spring. Dry weather and high grain prices generally increase restocker lamb supply, and decrease demand. A return to the restocker premiums over the ESTLI of 2014 and 2015 are likely under current seasonal outlooks. Store lamb prices are likely to be $80-90 per head this spring if the dry season eventuates. A weaker restocker premium will create issues and opportunities for lamb producers. 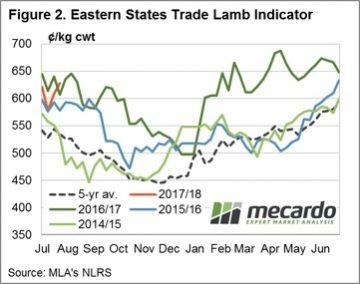 A likely outcome is the ESTLI falling to 500¢/kg cwt, under a dry season scenario, and restocker lambs are at a 50¢ premium. This puts a 16kg cwt lamb at a respectable $88 plus skin, relative to a 20kg finished lamb at $100 plus skin. Worst case scenario ESTLI is something like the 450¢ seen in spring 2014 (figure 2), and the 50¢ premium would put a 16kg store lamb at $80 plus skin, versus a trade lamb at $90 plus skin. So where is the opportunity? We see the 50¢ premium as a target sell for store lambs this spring, and lamb producers should be on the lookout for prices above this level as a sell signal, and below as a hold or buy.